In the last decade, both the number of organic farms and the area dedicated to organic farming have grown by 50% or more. 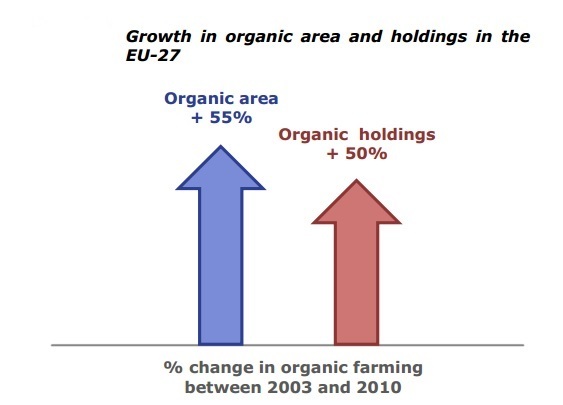 Organic area in the EU increased by about 500 000 hectares per year. As a result there are more than 186 000 organic farms across Europe, cultivating an area of 9.6 million hectares according to the latest Brief on organic farming published this week by the European Commission. Organic production patterns vary between EU Member States. However, across the EU, permanent pasture accounts for the biggest share of the organic area (about 45%) followed by cereals (around 15%) and permanent crops (about 13%). Organic animal production remains limited in comparison with the total animal production in the EU (about 1%). Organic farm managers tend to be younger than conventional farmers in the EU. In 2010, farmers younger than 55 represented 61.3% of the total in the organic sector but only 44.2% in non-organic agriculture. New consumer research launched by Bord Bia today has highlighted a return to growth in the retail value of organic food in Ireland for the first time since 2010. The Bord Bia study, funded by the Department Agriculture, Food and the Marine, values annual retail sales of organic food at €99.1 million, up from €97 million last year, with almost 60% of consumers surveyed purchasing organic produce in the last six months.